Some patients that have had a gastric bypass display a distension of the gastric pouch that may participate to weight regain. We studied the impact of pouch size reduction on weight changes. Seven patients aged 42.9±8.9 yrs, with an initial BMI of 42.5±5.7, who had had a Roux-en-Y gastric bypass (RYGB) were reoperated on from June 2007 to September 2008. All procedures except one had been done laparoscopically in an antegastric-antecolic fashion with a 30-50 cc vertical gastric pouch, and a sum of biliopancreatic and Roux lengths of 212±50 cm. Two patients with a BMI < 40 had a gastric band failure and RYGB included band removal, while in another patient a Nissen fundoplication was left untouched. Indication for revision was weight regain. Gastric pouch enlargement was documented on barium swallow in every case. 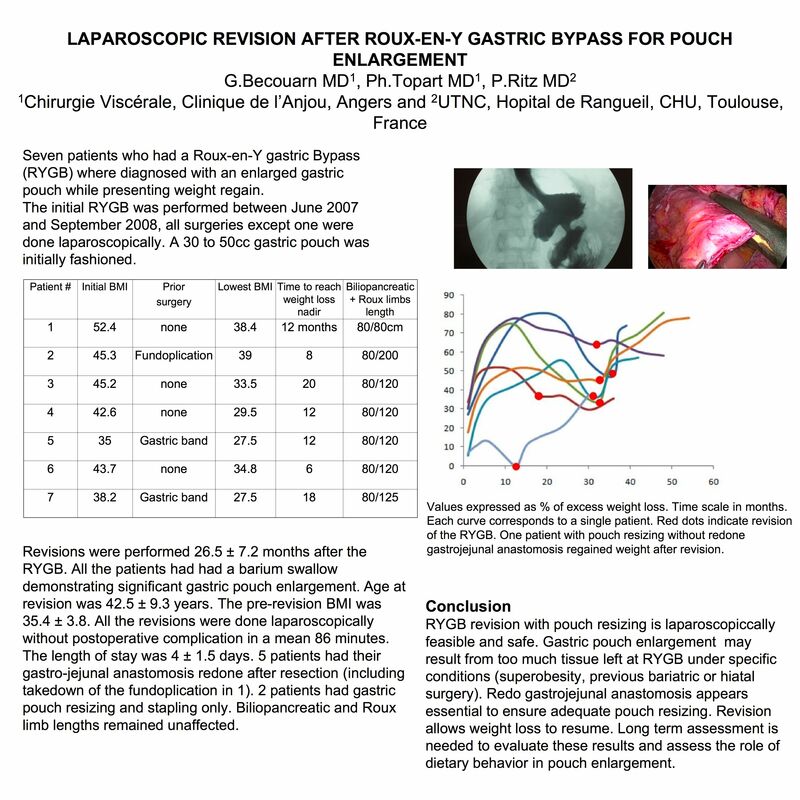 Revisions were performed laparoscopically 25.8 months after the RYGB. Gastric pouch size reduction (with takedown of a fundoplication valve in 1) and redo gastrojejunal anastomosis was performed over a mean 116 min in five patients. The other 2 patients had pouch size reduction with blind Roux loop resection only. Biliopancreatic and Roux limb length remained unchanged. There were no complications. After revision weight loss resumed in the 5 patients who had redo gastrojejunal anastomosis (as shown in the figure,large dot indicating revisional surgery). The other 2 patients with a follow-up of one year did not achieve further significant weight loss.Although long term efficacy and larger studies are warranted, laparoscopic revision of RYGB can be safely performed and seems to resume weight loss. Gastric pouch size reduction only may not be sufficient to achieve additional weight loss.